The rate on my equity line is low right now, but it can go up. 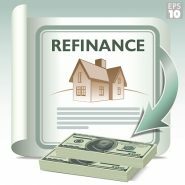 Can I pay it off in my refinance? On conventional loans, if you are paying off anything other than a first mortgage, the refinance is considered a “cash out” transaction. These are limited to 80 percent of your appraised value. So if your two loans don’t total more than 80 percent of your value, you can pay off both loans. Are there any exceptions? Yes, FHA will not consider your refinance a “cash out” loan if your second mortgage has been in place for at least 12 months, and you have not drawn more than $2,000 on it in the last 12 months. They will allow you to go to 97.5 percent and pay off both loans. However, FHA has a PMI premium above 80 percent, and this may add too much to your payment to make financial sense. Another exception is VA loans, which allow you to go to 100 percent if you are an eligible veteran. Conventional lenders will not consider it cash out if the equity line was originally used to purchase the home, and will refinance paying off both loans to 95 percent under that condition. I want to keep my equity line and just refinance my first mortgage. Can I do that? Yes, current guidelines allow you to leave your equity line in place, as long as the combined balance on your new loan and your equity line does not exceed 95 percent of your home’s value. Do I have to have permission from my equity line lender to refinance my first mortgage? If you are paying them off, you do not need their permission to refinance. If you are going to keep your equity line when you refinance, your equity line lender will have to sign a subordination agreement for you to refinance and leave it in place. How do I get them to do that? Your mortgage broker will handle that for you, along with your closing attorney, when you apply for your refinance loan. The subordination agreement is a legal document that your attorney will draw up. Your mortgage broker will provide your equity line lender with all the information they need to sign the subordination agreement. I welcome questions or comments and I can be reached at (864) 235-9596, or by e-mail at Mark@TheGreatestRates.com.